Acidity and alkalinity are measured on the pH scale. This scale runs from 0 (pure acid) to 14 (pure lye). The neutral point is 7–neither acid or alkaline. The scale is geometric not linear. That is from pH 7 the amount of acidity or alkalinity increases in geometric progression. For example, pH 5 is ten times more acid than pH 6 and pH 4 is 100 times more acid than pH 6 and so on. Similarly, pH 9 is ten times more alkaline than pH 8 and pH 10 is 100 times more alkaline than pH 8. Since few plants will survive in soil more acid than pH 4 or more alkaline than pH 8, pH 4 to pH 8 is the range that concerns most of us as gardeners. As mentioned earlier, dahlias prefer a pH of 6.5 as do most plants. A word of caution: whether the lowering or raising the pH, there is always the danger of doing to much. Use only as much adjusting material as is needed based on reliable soil tests. What can be done to lower the pH? Add chemicals that lower the pH. 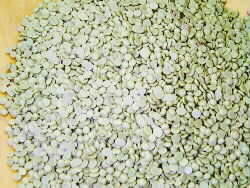 Sulfur — Over a period of 4 to 6 months in the soil, sulfur turns to sulfuric acid lowering the pH. In sandy soils, 8 pounds of sulfur per 1,000 square feet will lower the pH by about one point. 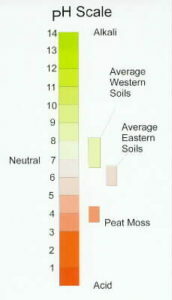 In heavy soils (clay/loam and clay) 25 pounds per 1,000 square feet is needed to lower the pH by one point. However, since the pH scale is geometric it would take more sulfur to move the pH from 8.5 to 7.5 than from 7.5 to 6.5 in any soil. Note: In very alkaline heavy clay soils sulfur is said to produce gypsum as a by product. For this reason, some say that sulfur should not be used to lower the pH of very heavy clays. Others disagree. All written materials that I have reviewed advise its use. I have used it very conservatively for several years with no observed ill effects. 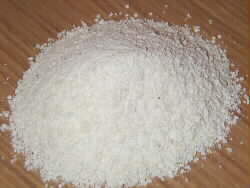 Aluminum Sulfate — Aluminum sulfate lowers the pH very effectively. So far, I have not heard of any bad side effects. However, it is expensive and only practical for small plots. The directions are typically on the bag. Commercially prepared soil acidifiers — Companies prepare mixtures of sulfur, iron, and other chemicals specifically for reducing the pH of garden soils. They are effective but very expensive except when used on very small plots.